A spa retreat in Wiltshire would bring you to a special area of England. 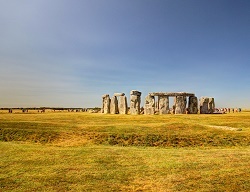 Two World Heritage sites are located within Wiltshire, they are Stonehenge and Avebury. Both are magnets for tourists visiting the South of England. Either would be a perfect day trip out whilst on your spa break. Along with the above World Heritage Sites why not take a trip to Salisbury, a beautiful small town that is the home of a magnificent Cathedral or even the Natural Trust gardens located at Stourhead. Over Half of Wiltshire has been chosen as an area of outstanding natural beauty, with this in mind there are several ways to enjoy the outdoors in this location. Book a spa break in Wiltshire and while you’re in the area there is the option to walk through the glorious countryside, hire bikes and explore further, get to the water and take in the views whilst fishing, book a round of golf or even take a ride down one of the many canals on a boat trip. A spa break in Wiltshire would give you calming and relaxing break away. A place where you can press pause on everyday life and have some me time. Furthermore a spa break in Wiltshire would leave you only around an hour away from London. To book your perfect spa break please call us on 0800 246 5511.